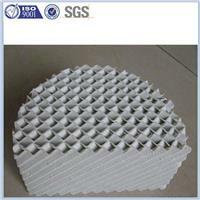 Ceramic Structured Packing is made up of many packing unit bodies that share the same geometry shape. Corrugated ceramic packing is called Kelapak packing abroad,it is also called high efficiency packing,because its separation-efficiency is several times to more than ten times of loose cops packing.Compared with loose cops plate tower packing.Corrugated plate ceramic packing has a great number of advantages such as high-efficiency, large thruput,low liquid holdup,unsharp amplification and good operability. ●Fining process of corrosive mixtures, which have strict requirements for pressure drop and number of theoretical sheets. 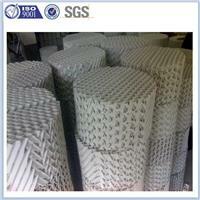 ●Vacuum treatment under absolute pressure higher than 1 mbar. ●Fining and distillation of halogen organic compounds.